Be the first to share your favorite memory, photo or story of Ocie. This memorial page is dedicated for family, friends and future generations to celebrate the life of their loved one. 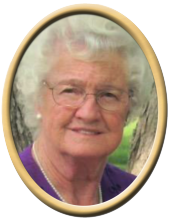 Ocie Hill Daly Smith, 89, of Laceys Spring, passed away Wednesday. Mrs. Smith enjoyed camping with the Holiday Ramblers Club and friends. She loved gardening, shopping and going out to eat with her daughter, friends and family. She was preceded in death by father, Zebedee Hill, mother, Nina Hill, brothers, Duran Hill and Wildes Hill, and sister, Metresic "Patsy" Hill Rutledge. Surviving are daughter, Lesa Daly (Spencer Jr.) Warden, sister, Beatrice Hill Griffin, sister, Elizabeth Hill Muhlhauser, step grandson, Bradley (Ramona) Warden, step great granddaughter, Zoe Nicole Warden, and many nieces, nephews and friends. Visitation will be Friday 11:00 AM to 1:00 PM at New Hope Funeral Home. Services will follow at 1:00 pm with Bro. Brian Mosley officiating. Interment will be in the Huntsville Memory Gardens. "Email Address" would like to share the life celebration of Ocie Hill Daly Smith. Click on the "link" to go to share a favorite memory or leave a condolence message for the family.